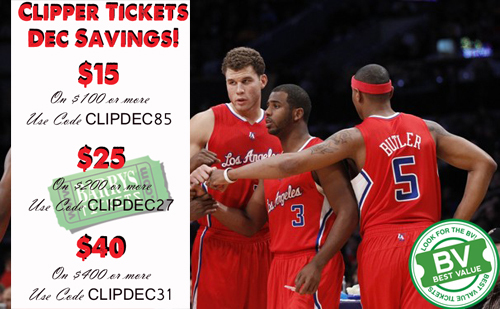 Save 40% on Clippers Tickets in the Month Of December. Official Partner of the LA Clippers Barry’s Tickets is pleased to offer special discounts on Clippers Tickets for the month of December. Our Clippers Tickets Discount Codes and Promo Codes are exclusive to Barry’s Tickets Best Value Tickets which are already priced down.The Los Angeles Clippers closed the month of November victorious, after beating the Sacramento Kings in their last game of the month. Holding a 12-5 winning record, the Clips have done what they should have to start the season. Now, it’s time for them to take the next step and set the foundation for the championship contention. The Clippers have a statement-game to start December. On Sunday, December 1, they take on Paul George and the Indiana Pacers, who are currently leading the NBA with a 15-1 record. The Pacers are one of the favorites to win the Eastern Conference but also the Larry O’Brien trophy this season, so this game is a potential NBA Finals matchup. This is a must-win game for the Clips. Then the Clippers go on a seven-game road trip, which will last 10 days in total. Another one tough game at home comes just after the team returns from its road trip. On December 16, Doc Rivers’s team takes on the defending Western Conference champions, San Antonio Spurs. The Spurs are currently leading the West and they stand big chances of winning it all again in the conference this season, too. Two days later, on Wednesday December 18, Anthony Davis and his company of young and energetic teammates come to town. This might be a close game but the Clippers should come out victorious. The Clippers then play back-to-back home games on the weekend of December 21 and 22. The first game is against the Denver Nuggets. Despite all the changes the Nuggets have gone through this season and the fact they are still missing their superstar forward Danilo Gallinari, they still are a dangerous opponent. The Minnesota Timberwolves are the next opponent for LA. The Wolves are more dangerous than they have ever been in the last few seasons. The Clippers should be very cautious on their perimeter defense in this game, as Kevin Love and Kevin Martin are surging from beyond the arc. After a two-game road trip, the Clippers return at the Staples Center for the two final games of the year. The first one is schedule for December 28, when they will meet the Utah Jazz. The Jazz currently rank last in the season with just two wins in their first 17 games. The last game of 2013 for the Los Angeles Clippers comes on Monday December 30 at the Staples Center against the Phoenix Suns. This will be the first meeting of the two teams after the major trade that sent Eric Bledsoe and Caron Butler to the Suns and J.J. Redick alongside Jared Dudley to LA. Discount and Promo Codes on Clippers Tickets are good on BEST VALUE (BV) tickets only and are subject to change at anytime!